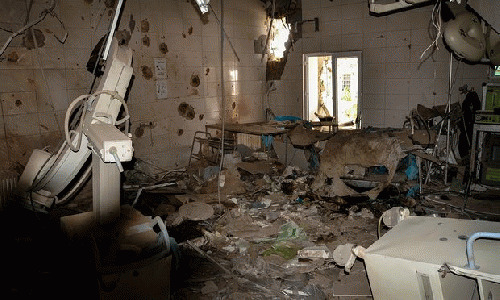 An MSF hospital in Kunduz, Afghanistan, hit by an airstrike. UCLA was on lockdown Wednesday after a shooting in an engineering lab. There were at least two victims, the university said, but their conditions were not immediately clear. A campus-wide lockdown was put in place, according to a tweet from the UCLA newsroom. It was not clear if a gunman was still on the loose. The shooting in Engineering Building #4 put nearby Ronald Reagan Medical Center on lockdown as well. A nurse there said the hospital had not yet received any patients from the shooting. Both the FBI and the Bureau of Alcohol, Tobacco, Firearms and Explosives were responding to the incident at the request of the LAPD, but officials told NBC News they had no independent information yet.